If you’re a regular reader of the blog, you’ll know that I’m a big Lookout Games fanboy. Over the years, I have found that many of the non-Bohnanza games offered by the publisher become permanent members of my game collection. Agricola previously had been my favorite Lookout game; in fact in my top-5 all time – but the Colonists might fight for that position! I had written a preview of the game prior to Essen, using the introductory rulebook as my guide. However, now that I’ve played the game a lot more, and I have taught it to many people, I will write out my teaching spiel as the rules review portion of this piece. 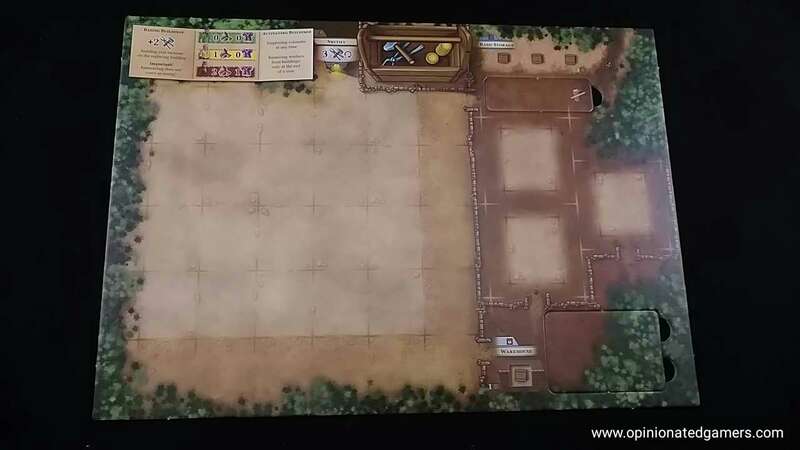 I won’t cover all the little details – I did that with Agricola way back when, and then ended up being a 21-page review! – but you should get a good feel for how the game works and what your options are. Let’s start with the overall shape of the game and the goal. At the start of the game, players decide how many eras they will play. The full game stretches over 4 Eras, though you get a very satisfying game experience even playing a single era. In order to set the game up correctly, you need to agree upon which Eras will be played in the game. Each era is broken up into 5 years, and in each year, there are 2 separate rounds (summer and winter). In each round, players will take turns taking three consecutive actions. So, in each era, you have exactly 30 actions to take to accomplish all your goals (3 actions per round, 2 rounds in a year, 5 years in an era). The goal of the game is to have the highest point total. The points are only calculated at the conclusion of the game. There are a few main ways to score points in the game. For now, let’s assume that you’re starting the game in the first Era. You must first set up the board. There are 2 Market pieces (double hexes) and 12 Era Zero hexes which are arranged on the table. Each of these hexes represents a location in the town, and each has a specific action that is printed on the hex. Each player is given their own board which represents their own part of the town. On this board, you start with 2 Farms – each comes with its own Farmer meeple. The majority of the board is space for you to build up to 30 rectangular buildings. There is also a storage area with three larger places for storage facilities. You also get a few starting goods which are kept in your storage area as well as 6 Tools which are placed in your Toolbox. The capacity of any storage area is denoted by the number of crates seen in that area. The goods themselves are found on about a thousand little cardboard chits. 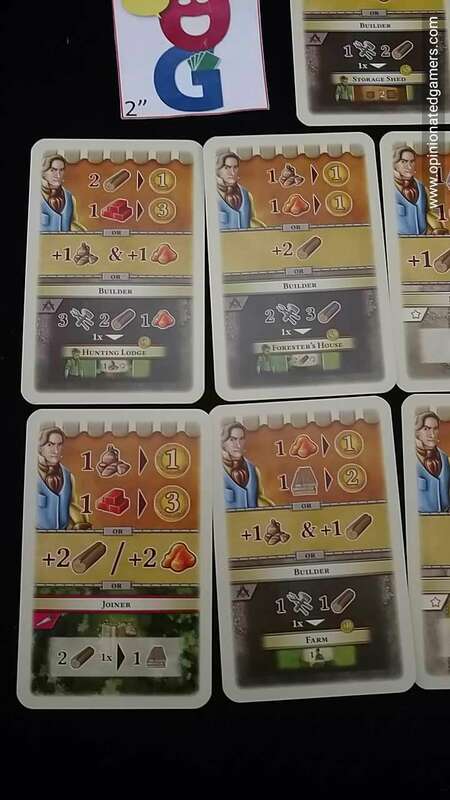 Finally, choose 4 Colony cards and place them face up next to the board. Depending on which Colonies are chosen, you may have to get extra bits for setup. 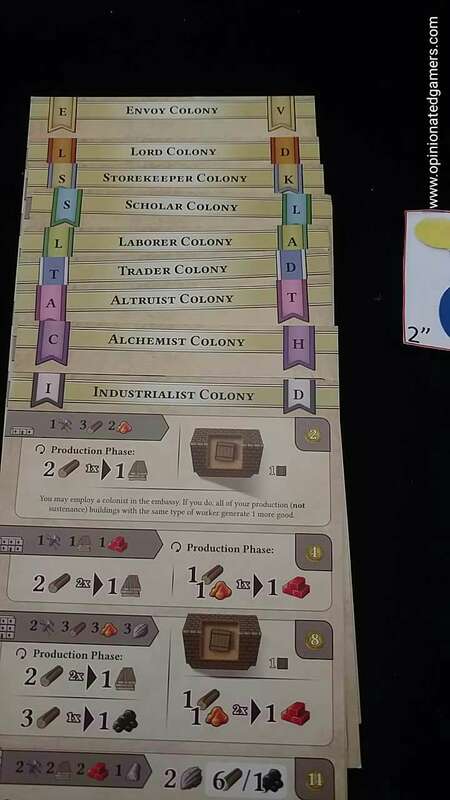 This will be made clear on each of the Colony set up cards that you select. Now you’re ready to move into Era 1. 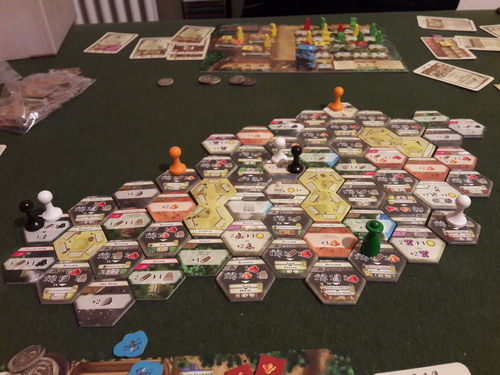 An example Era 0 setup… These are just the first 12 tiles and 2 markets! Each Era has a specific set of components. 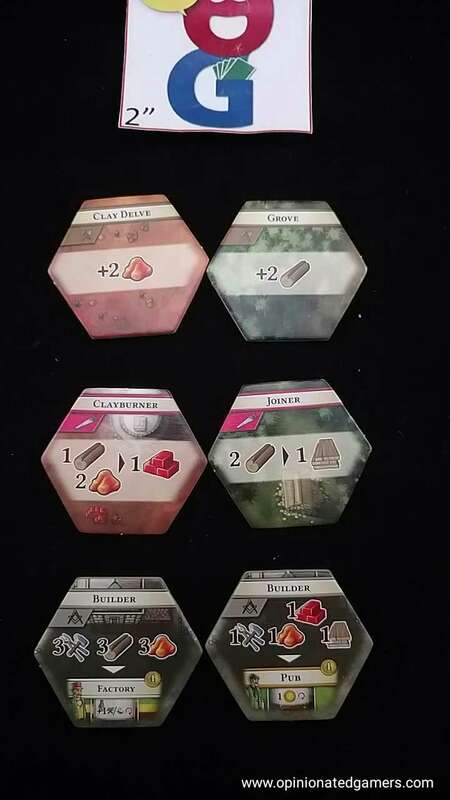 Each comes with 12 hex tiles with buildings and locations specific to that Era. There are also matching rectangular building tiles as well as goods chits. Each Era has its own deck of 7 Market cards, and each has a deck of 35 Improvement cards. There is also an Era reminder card which helpfully reminds you of any needed setup for the particular Era as well as the current cost of the Fee, which I’ll explain in a bit. As you start each Era, pull the needed materials out of the box. If you’re OCD like me, the stuff will already be bagged in Era-specific packaging for easy setup. Prior to the start of the first year, shuffle the tiles for the Era and then flip 3 faceup near the board. These tiles will be added to the town at the end of the year. Next, flip the top card of the Market deck up – this card tells you what actions are available at the Market tiles this year. Each player has a steward (big wooden pawn) that shows their current location. The players can choose where to place the steward to start the game, but then for the rest of the game, any future turns must begin with the steward in the place where it ended the previous turn. Again, each player will take three consecutive actions on their turn, and then play passes around the board. Once all players have taken 3 actions, the half-year is considered over – and you can keep track of this on the handy Season card that tracks the actions throughout the entire game Year. So, you get three actions. In general, in order to take an action, you must move your Steward to a new hex and then take the action of the hex on which you land. You must be able to take the action of any hex that you stop on. At the start of the game, the movement range of your Steward is one space which means all your moves must be contiguous, with the exception that you can teleport your Steward onto any Market tile regardless of starting position. Markets – there are two Market tiles to start the game. Remember that you can always jump to these tiles from any other location. When you land on the Market tile, you have three options – and these options change each year depending on what is on the current Market card. In general, the top section allows you sell goods – this is returning certain goods to the supply in return for VPs. The middle section of the card simply gives you resources for free. 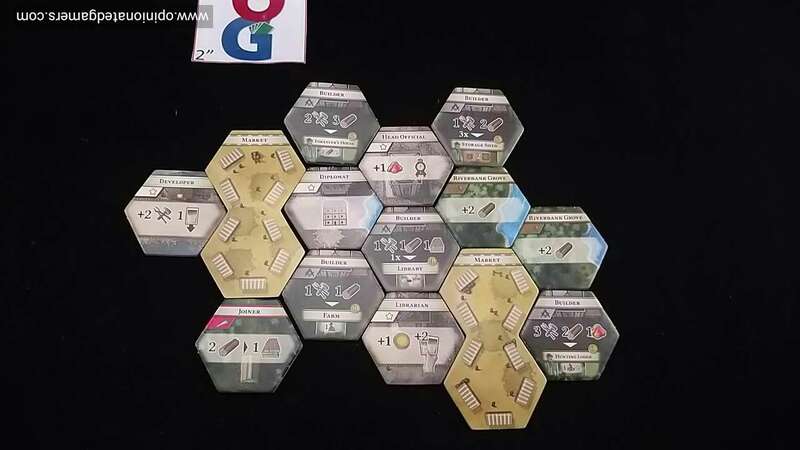 The bottom section of each Market card has a building action where you can build a rectangular building tile to your board for specific resources. These building actions are also found on the hex tiles, and in general, the Market building actions are weaker than those found on the hexes. Diplomat – this is where you can build Embassies with the Colonies in the game – this is pretty complicated and will get its own section later. Librarian – each time you come here, you get 1VP from the supply and then you also draw the top two cards from the Improvement deck and keep one of them. You have a hand limit of 6 Improvement cards. There is no way to get rid of them other than playing them. Developer – this is the place where you play Improvement cards. Each time you land here, you play one Improvement card from your hand and resolve it. For now, those are the main exceptions to the broad categories. It’s probably a good idea when playing with new people to go over all of the possible actions for an Era prior to the start of the Era – just so everyone knows the possibilities! When I’m teaching the game, I definitely go over each hex in Era 0 and 1 prior to starting so that people start on level ground. So is that it? No. Not even close. There are still a few other rules to cover before you can start taking your actions. First up, the idea of storage. When you start the game, you have a few goods in your Basic Storage area. You also have a single space in your Warehouse. Whenever you need to use goods, they have to come from your Storage area (and NOT from your Warehouse or from your production buildings). Resources can be freely exchanged between Storage and Warehouse spaces, but only those things in Storage can be used to buy/build things. Your player board has space for up to three Storage facilities – and each of these can hold at least two more goods. You will definitely need some of these as the game progresses, as you will most definitely be needing to build or buy things that cost more than 3 goods! In between each of your actions, you can move goods from your production areas to your storage spaces, but this is a one-way movement – once goods are taken from production buildings, you either have to use them or discard them (if you need the space for something else). Once you have built some production buildings, these tiles will produce resources at the end of each Year. Each production tile can hold a year’s worth of production right on the tile. However, you cannot use these resources for building or paying costs. They must be moved to your Storage areas in order to be used. You can discard goods from your Storage at any time. 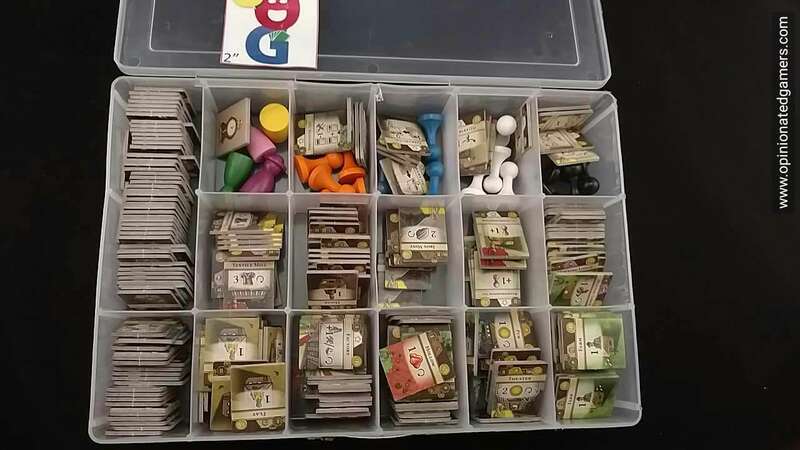 However, in the course of a single action, you must have all your needed goods in Storage – figuring out how to move and store your goods may be the most important part being successful in the game. Second, movement. When you start the game, your Steward has a range of 1 space, and this makes it easy – you just jump to a Market or move to an adjacent hex. Remember that you must always be able to take the action of the space where you stop moving. If you land on a building hex, you must pay the goods and build the building. If you are at a goods space (or on the Market and choose the collect goods action), you must take the goods but you could elect to discard all of them – thus, you have taken the action though there is no change in the overall game state. Importantly, if your Steward moves (because in some cases you may have more than one Steward) during a turn, it CAN NOT end the turn on the same hex on which it started. Later in the game, if your movement range is higher – you only have to take the action of the hex on which your movement ends. Also, note that each time that you jump to the Market, your movement automatically ends and you must take one of the actions there. Third, the Fee. If you end your movement on a non-Market hex that is already occupied by another player, you must pay “the Fee” to each player who is already on that hex. The current cost of the Fee is found on the Era reminder card. If you are unable to pay the fee, you cannot move to that hex. The Fee increases as you move into the later Eras of the game. Fourth, Colonists. As far as buildings go, there are two types: those that produce Colonists and those that require Colonists to make them do things. (There is an exception to this, the Library – but that’s for another time). When you start the game, you have two Farms, each comes with its own green farmer meeple. Later, you could convert a Farm to an Estate – and that comes with a total of 3 Farmers. Later in the game, Flats (1 Yellow) and Apartments (3 Yellow) will help you get Citizens into more advanced buildings. If you make it to the end of the game, you will need Red Merchants from Houses and Community Halls. As you build buildings, you can see which color worker is needed for them in the bottom left corner. As long as you have a free worker (who is still living in his “house”), you can move him into any new building at the time of construction. If you are placing a Yellow Citizen or a Red Merchant, you must pay a sustenance fee when you initially employ the meeple as well as paying the fee again at the end of every year. It is also important to note that you cannot remove a Colonist from an employed building until the end of a Year. 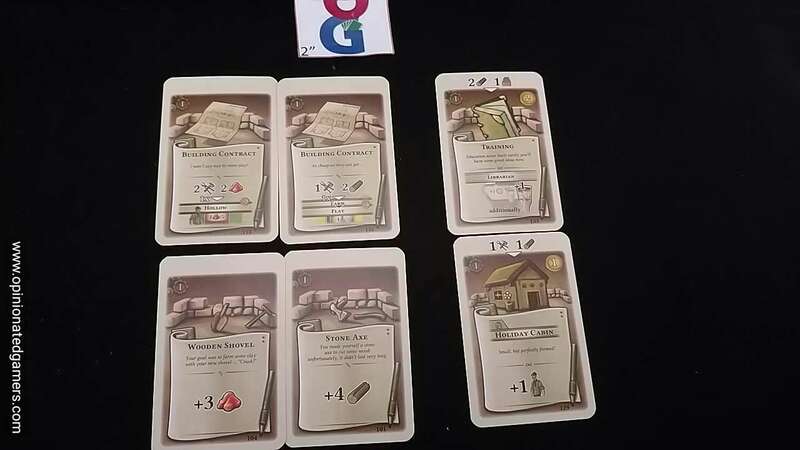 Colonists are important because buildings generally do not provide you any benefit without a worker on the tile – AND only employed Colonists are worth victory points at the end of the game. Fifth, Improvements. Remember, there is a deck of Improvement cards for each Era. You have to get them at the Librarian tile and you can play them at the Developer tile. Some of these provide instant effects (generally resources), some provide ongoing effects – these have a cost to play them and often provide VPs at the end of the game, and some give you a limited number of repeat uses. You are limited to six Improvement cards in your hand at any time, and you cannot discard them. If your hand is full, you may not go to the Librarian tile as you will not be able to complete the action there. Some of the different Embassies have additional chits, buildings or pawns that will come into play if that embassy is in play. 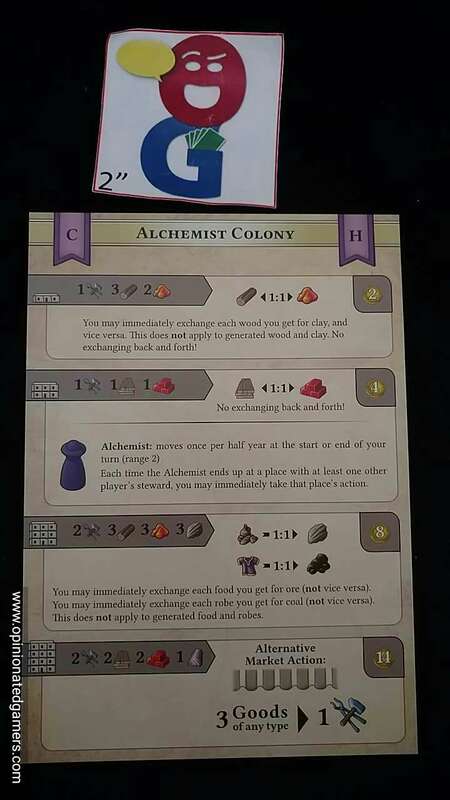 All the rules for each are summarized on the Colony cards, so they can be reviewed at the start of each game. Suffice it to say that the Embassies are the most complicated part of the game because different players will likely choose different Embassies to develop, and keeping track of all of the differing rules that apply to each player becomes everyone’s responsibility. 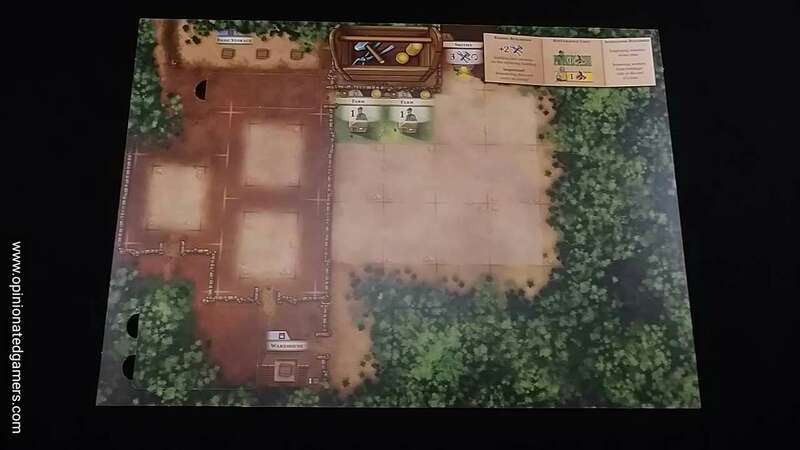 The starting/learning scenario for The Colonists wisely leaves the Embassies out of play so that new players can focus on learning the basics of the game. OK, so back to the game – I know that there are lots of little rules that I’ve left out of the explanation above. But it’s already been almost 3,000 words, and the goal is just to get you to have a feel for the game and its complexity… So, we’ve started the game, and we’ve played the first year. Each player has taken their three actions and done stuff. At the end of the year, there are a few pieces of upkeep that must be done (helpfully summarized on its own reminder card). First, the starting player goes to whoever currently holds the marker. If no one had taken an action to change the starting player, nothing changes here. Then, the three tiles that were flipped up at the beginning of the year are placed onto the map by the current start player. Each of these tiles must be placed so that they are adjacent on two sides to other tiles on the board. Occasionally a tile will come up that simply replaces a previously placed tile. Third, players may now redistribute Colonists from buildings – note that this is the ONLY time each year where you can remove a Colonist from a building where he is working. Fourth, once all your meeples are set, you then pay the Sustenance fee for each employed Yellow and Red meeple (Green farmers are free!). Finally, produce stuff – each production building which is staffed with a correct employee makes stuff. Your toolbox also generates 3 Tools each turn. At the end of the fifth year, the Era ends. You still go through the five-stage upkeep phase as outlined above. If you have reached the pre-determined end of your game, you move to scoring. Otherwise, take a minute to fish out the material for the next Era and set up the next board for the first year in the next Era. Scoring – You only calculate scores once in the game – at the very end. There are 4 main ways to score points. The player with the most VPs wins. Ties go to the player who took their initial three actions later in turn order (if you can remember who started the game!). I’ve played the full four era game on three occasions, and it is truly an epic affair. I would definitely recommend this only for players who have played a shorter one-era game at least once or twice. There is so much going on in the complete game, and only one chance to see how you’re doing relatively speaking (when you score at the end) – if you are not sure what you’re doing, it’s going to be a frustrating three or four hours! The length of each turn gets longer as you get deeper into the game. You will have many more options of actions as the board continues to grow bigger and bigger each Year, and you also have so many more things to keep track of. Playing time for Era 1 might be as little as 30 minutes for a 4p game, but all of my Era 4’s have been closer to 90 minutes… It’s an engrossing 90 minutes, but it can feel long as there isn’t anything to do when it’s not your turn. Players cannot take turns simultaneously because the end position of the pawns is vital for knowing where/when/who to pay the Fee to. When starting to learn the game, I would definitely recommend one or two games of the beginner version – using the pre-set maps provided in the introductory rulebook as well as leaving out the Embassies in these learning games. I have seen far too many groups at conventions sit down at the table and proclaim that they are all “experienced gamers” and we should just play the full 4-era game for our first experience. Six or seven hours later, those same gamers are looking pretty miserable because they have had to slog through a bunch of rules and try to play a fairly complex game without really understanding how the mechanisms work together – much less how to take advantage of all the rule-breaking changes provided by the Embassies. I think that you will set yourself up for a bad outcome and a bad opinion of the game if you go whole-hog right off the bat. (I say the same thing about Agricola; even though I much prefer the game with the cards, I think you really should play the Family game once or twice before you start to add in all the complexity of the cards). Here is a single Embassy – think about having 4 of these to digest in your first game! Use the basic game to learn how the different Era 0/1 tiles work and how to juggle your resources around between your production tiles, warehouses and storage spaces. You’ll also need to learn how to visualize the possibly complicated steps necessary to get to a particular spot. For instance, if you are playing the intro game and you want to build and staff the Factory (which is generally what I task newbies with as their goal for the intro game) – you’ll need to do all your regular stuff, and then figure out how to set aside maybe 7 actions to upgrade a Farm to a Flat as well as to build a Factory. You’ll need to collect all the necessary resources as you need them. You’ll also need to make sure that you have at least one food chit to pay the sustenance cost of your yellow worker when you move him into the factory at the end of the game. Finally, making and upgrading the Embassies can cost you a bunch of resources. If you don’t understand the basic game, you might end up spending much of your hard earned stuff on special powers that you can’t even use well – and at the same time, you’ve cost yourself the resources and, more importantly, your limited number of actions that you could have used solidifying your production engine. I do think that you need to have figured out how the game works first before you can even properly value how/when you want to spend the resources/actions on the embassies. But – once you have got the hang of the game rules, the Embassies add such a depth to the game. The four embassies available at the start of the game give so many different possible strategic paths, and each player is free to choose amongst them. There might be a particular combination that looks good, but if everyone goes for the same setup, then there will be fighting for all the hexes that work with those powers. In that case, a player who has chosen a different path might be left alone and free to develop his player board without having to worry too much about the others. Furthermore, the 126 different starting combinations of embassies, and the different ways that they interact with each other make each game a different animal, and will require you to definitely figure out how to best go about using them. The possibilities are increased 5-fold when you choose one of the remaining embassies to add to the game at the start of Era 3. One important thing to note – You have to agree on the endpoint of the game at the start because this will definitely impact how you approach the game. For instance, in a Era 1 only game, a good goal to have is to get at least one Yellow meeple employed in a Factory (the only building in Era 0 or 1 that uses a Yellow meeple) – as the 6VP at the end of the game is a big part of your final score. However, if you were playing a longer game, you would not necessarily be as interested in accomplishing all of that by the end of the first Era. Sure, you’d need to have some Yellow meeples by the end of the game, but the urgency of the timing is completely different. Some players might still want to have a good source of yellow meeples so that they can hit up the yellow buildings in Era 2 from the get-go while other players might still want to concentrate on shoring up their Green building production machine. If you suddenly decide to change the endpoint of a game, you might completely nerf a player out of the final result because they may have been building towards a specific board situation at a particular time. That being said, one of the things that I love about the game is the way that it can accommodate different player numbers and different lengths of the game. You can choose to play any number of eras, 1 to 4, and you can choose to start at any point. 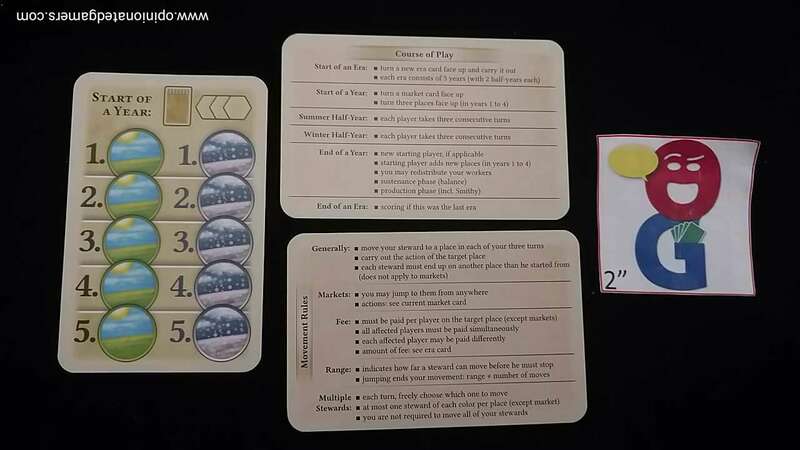 If you wanted to play a two era game comprised of Era 3 and 4, the rules tell you how to set up the board (As you’ll still have to build it hex by hex as if you started in Era 1) as well as giving you resources, Improvements, and board buildings to represent what your personal area should look like at that particular stage of the game. There are really no rule changes for the number of players – even solo! – what changes is how players need to approach the game as they will more likely have to spend some of their resources on “the Fee” when more players are in the game. So far, I think my sweet spot would be a two-era game (preferably Eras 2 and 3) player with 2 or 3 players. The downtime with 4 players can sometimes be a bit much, and there isn’t an additional interaction to be gained from that extra player. It is nice, however, to have one or two opponents to at least fight for spaces with you as this adds an extra dimension of timing and blocking to the game that you don’t see when playing solo. I have played the game solo a few times, first to learn the game and then once to play a whole 4-era game when I couldn’t find anyone else to try it with – and it all works fine. It’s just better to me with players to play against. And, as I’ve had to teach the game about a eight times now, I’ve played the Intro game at least that many times (as I really only play that version with newbies) – and I’m not even tired of that. I am still challenged to improve upon my score, or sometimes I try to simply set new goals for myself (such as building 3 Factories and staffing them with Citizens) that at least give me a new way to look at the game. The reason I prefer to end the games at either Era 1 or Era 3 is because each is the watershed moment for the yellow or red meeples. 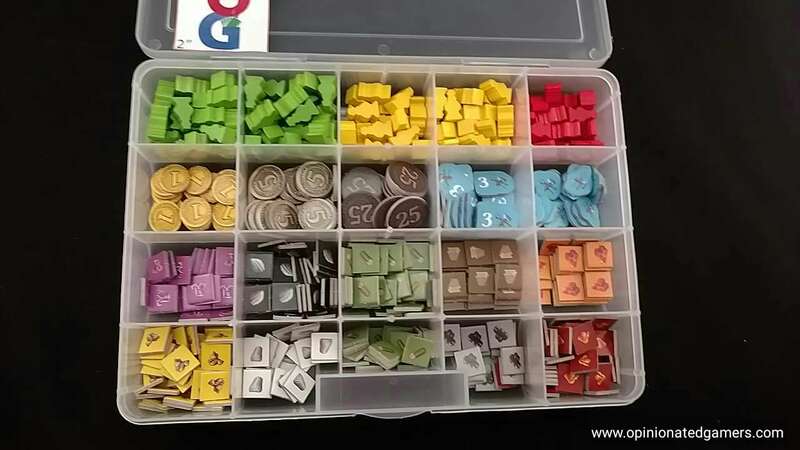 I find that there is a big decision to be made about whether to move forward to make/employ the new color meeple prior to the end of the game. In both cases, I do not think it is necessary to get to the newest color meeple in order to win – I have won an intro game (albeit against newbies) without straying from the green meeples, and I have tied on VPs in a game ending in Era 3 without needing a Red meeple. The other nice thing about sticking to just two eras is that the entire game generally fits in a two-hour window which is just right for me. The components are well produced, and my box probably weighs about 10 pounds. There are a metric crap-ton of chits, tiles and wooden bits in the game, and I’ve organized them into two plastic jewelry trays that I found at Hobby Lobby. They keep everything in a nice clean fashion during play and they also help stop things from rattling around in the box. The cards specific for each Era have been bagged by Era so that you just pull out the bag(s) that you need. Given everything that comes in the box, I doubt that I’ll get tired of it – each game provides a familiar framework with the same tiles, but the order in which they come out it will be different in each game. 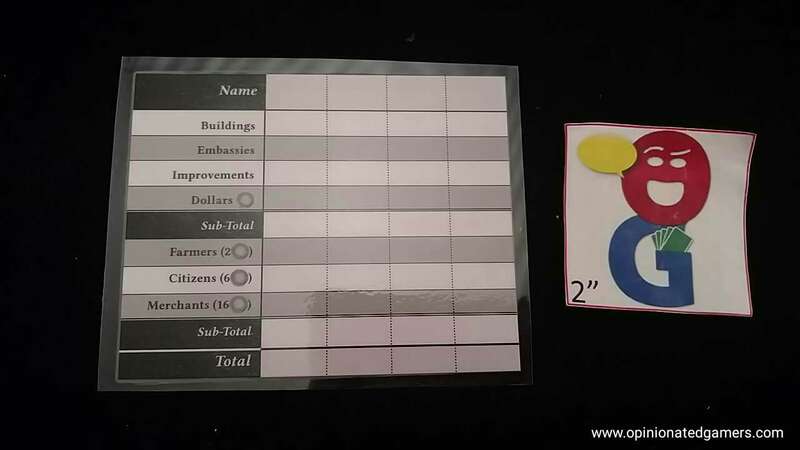 You’ll also see different Improvement cards, and of course, the different Embassies that are chosen will affect how the game is played. While I do not have any inside information (yet), the game is also rife with possibilities for expansion. I can see new Improvement decks, a fifth or sixth Era, or new Embassies with different special powers. But, even if nothing else is ever made for the game, it has clearly become one of my new favorite games – and one that I see myself playing over and over again. Alan H: I would agree with nearly everything Dale highlights. I have enjoyed the game enormously, but I have played with some people who can’t wait to leave it, so my suspicions about the breadth of the audience were wrong. It has a more narrow field than I anticipated. It is not the game length, but the minutiae of decisions that others have not enjoyed. Funnily enough this is the very reason that I love it. My inclinations towards game increase as the variety posed in a game and you cannot complain about this in The Colonists. I really enjoy the multitude of paths (literally) to follow. If one or more players take their time in this length of game I find myself distracted about the earlier thoughts I had, so I would prefer 2 or 3 player games for this reason. My disagreement with Dale is that while I have found setting a limit on the eras sensible, often the enjoyment of the game exceeds what was expected and we play “just one more era”, which is another 90 minutes. It’s a good trait to have though in such an amazing game. I prefer longer games where the satisfaction comes from a long term accomplishment so I like 3 and 4 era games. If I wanted a quick game of 2 hours, I’d play something else. My overall impression is hugely positive and I do hope the other 4 eras make it to an expansion or two. Larry (1 play): I’ve only played this once, with 2 players, Eras I and II. Which is to say I’ve barely played it at all. At least, that’s how it feels to me. I quite liked the challenge of coming up with a good 3-hex path each turn, to fulfill your immediate goal. But there really wasn’t much connectedness to those goals, no real story arc–I just stumbled from one to the next. Part of that, I’m sure, is lack of experience. But after reading reviews of the game, including Dale’s, I suspect that a bigger part is that Eras III and IV is where the game really comes into focus. So feel free to take my comments with a big grain of salt, since I haven’t experienced most of what this game has to offer. One thing that surprised me about The Colonists is that it’s considerably more straightforward than I thought it would be. If you’re an experienced Eurogamer, it’s not hard to learn the concepts and begin playing. You have to struggle a bit with the restrictions of storage, but the rest is fairly familiar. Of course, there’s a good deal of exploration, as you figure out which things are important and which aren’t, particularly which seemingly insignificant items will be vital in the next Era (most of which I’m unaware of myself). But conceptually, this isn’t a difficult game, which, given its scope and length, is probably a good thing. I’m glad to see Dale’s note that his favorite way of playing the game is Eras II and III, with 2 players. That was my thought for future games after finishing my first one, although I’d like to experience Era IV at least once. The real question is how many times I’ll have the chance to play this. My opportunities for 2-player gaming are limited and it’s not obvious to me what additional players will add to the experience other than downtime and some (possibly annoying) blocking. I do hope to explore the system some more, as it’s quite intriguing. Right now, though, this is a good game that I’m glad I got the chance to play, but it doesn’t rank with my favorites of the year. Maybe after I investigate it some more, and its story arc becomes more familiar to me, that will change. Craig V (1 play): I have only had the opportunity to play the Introductory Game. 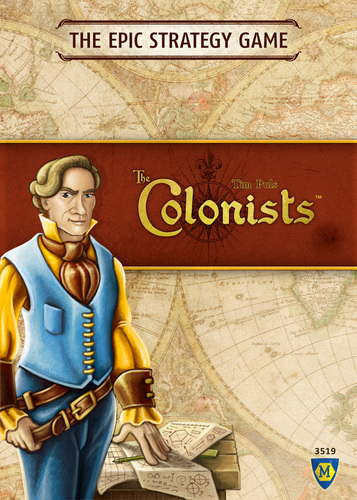 I was very impressed with The Colonists overall and felt that it was a complete gaming experience. There is a lot happening within the game and it really feels like a synergistic composition of elements from many other games. I can’t image the development time that went into making everything work in the cohesive way that it does. However, even the Introductory Game is fairly lengthy, so playing the full game seems like a time investment that I may never be able to commit to doing. Being able to “save” the game in between Eras is a fantastic feature that definitely makes playing a full game over several sessions an attractive possibility, but I still don’t feel like I’ll ever have the ability to do that just based on time limitations and interest in other games and hobbies. Also, it seems necessary to play with other players that have similar gameplay experience levels with The Colonists to keep everything on an even keel. I’d like to play this game again at some point, but it is a lot to take in. I would really need to be in the mood to play something heavy and long and that’s just thinking about the Introductory Game and not the piles of other stuff that gets added with each subsequent Era! I like it. Lorna, Craig V, Larry, Craig M.